OVERVIEW: My IT Infra is committed to providing industry-leading webcasting and virtual events that meet the performance, value, and reliability requirements of businesses of all types and sizes. Our focus is on the entire range and vast dimensions of our services offering. With our webcasting, you can broadcast your live event over secure web, giving everyone front row seat at their PC, Smartphone’s, and Tablets. Using high quality video, pre-produced video, and even your own PowerPoint slides, we can produce live show that looks and feels more like professional network TV Shows, not a fuzzy, poorly produced webinar. 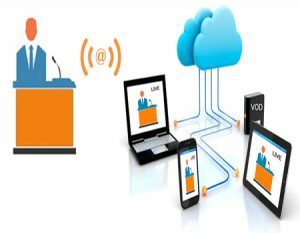 We extend the reach of your event using Live or On-Demand technology called webcasting to share the event experience with anyone, anywhere at any time. Furthermore, we can help you customize every aspect of your webcast so you can maintain brand consistency. Now, Engage Audiences Via the Web From large scale product launches to small inter-company meetings, webcasting is an economical way to deliver your message and interact with your viewers. WEBCASTING is one of the most efficient and cost-effective communication tool ever developed to build your business, and this dynamic new medium is just getting started. First, Events are recorded and/or filmed on-site using our professional equipment ensuring the highest quality experience. The recorded media is then sent to our specialized streaming servers and streamed over the internet. Slideshow presentations with optional synchronization are made available to your audience so that they may experience the presentation crisply and clearly. 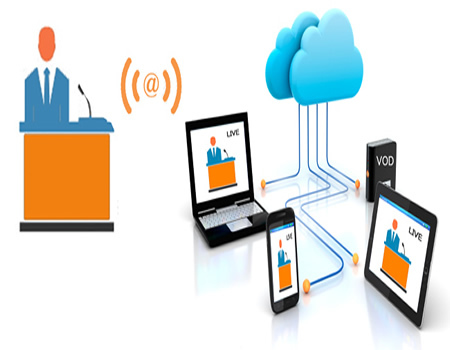 Interactive: Webcasting enables audience feedback, information sharing and annotation. Separation: It Separates host and attendee views so you can better manage your meeting. connect and interact instantly with a new or existing virtual audience. Branding: It will customize your entire Event with your company logo. Real time recording: It provides Real-time recording for future playback. Innovative: Boost your company image and reputation. Social events can be customized with designer themes and slide shows. Extend the life of your event through on-demand playback. Understand who attended through detailed reporting. Interact live non-intrusively through online polling, Q&A, etc. Securely broadcast corporate events / meetings to your global offices. Multicast / Intranet / Internet Broadcast can be easily Integrate with MNC’s own network. Advertisement / Marketing Company can use the platform to reach global audience.